My family and I are just home after time in China, making the jarring adjustments we’ve come to expect after a number of visits to that vast and complex civilization. One paradox I’m currently hung up on is how that nominally communist country’s approach to capitalism actually involves hiring lots of people to work at its myriad retail and service businesses, versus America’s barren mega-stores with fewer employees and more self-serve robot cashiers upon every visit. My favorite contrast upon landing, especially in Los Angeles, comes from the awe-inspiring diversity of humans on the go in our country, with every color and creed and style set against the homogeneity of the Chinese population; I could count the white and black people I saw in a week with one hand. Most specifically annoying is the inevitable disorientation in circadian time, with the result that my July 4, 2017 began involuntarily at 3:30 am. These sources of cultural whiplash are familiar. But this homecoming came with a dissonance I couldn’t have imagined on any prior Independence Day. After giving him relatively little thought for seven whole days, I came off the jetway in Nashville to immediately see Donald Trump’s head braying away on multiple airport video screens like some dystopian dictator. I realized that in our absence, another week had gone by during which his corrosion of democracy had flowed on like an acidic power washer. Indeed the one story from the US news that snapped me to attention last week was the White House task force requesting that the states submit registration and demographic data on all American voters. That was a hell of a thing to read, via a censorship-defeating VPN, from the ground in a nation with one of the world’s most highly sophisticated autocracies. One of the books I picked up for the trip was The Three Body Problem, an award-winning science fiction thriller by Chinese novelist Liu Cixin. It opens with frightening scenes of mob violence and fascist control from the Cultural Revolution. So during the week, I thought about Chairman Mao — how HIS visage was required to be in sight of all Chinese at all times. I thought about Maoism’s insistence on cult-like devotion and on forced reliance on the party’s version of truth instead of objective reality and the inquiry of a free press. I thought of police power, mob violence and propaganda — of the Cultural Revolution’s war on intellectuals, academics, scientists, philosophers and artists. I thought of Mao’s life of privilege and his architecture of patronage lording over a population that starved under incompetent statist economics. And as I thought about it, I decided the most significant differences between Maoism and Trumpism lie not in the realm of ideology or values but merely in evolution and maturity. Trumpism is relatively young. The other book I’m working on, one rather more carefully chosen for the times, is Thomas Ricks’s new dual biography and political/literary study Churchill and Orwell: The Fight For Freedom. As these great men come into their own in the 1930s, they become chillingly aware of the forces of darkness gathering and growing in the world around them. They become societal bell ringers, and neither is appreciated for it at first. They both have to wrest themselves away from the complacency of party line and polarized politics. Winston Churchill reprimands his fellow Tories, most of whom appease Nazism and some who go farther — aristocrats who rather relish Hitler’s iron fisted, hierarchical worldview. Orwell has the scales pulled from his eyes in the Spanish Civil War and returns to England to write Homage To Catalonia, in which he concedes that the political left and not just the right is capable of mass lies and authoritarianism. He loses more friends than he makes. Churchill turns enough people his way to be elected Prime Minister but only once most of England has realized the hard way he was right about Hitler all along. Churchill I admire in that marble bust sort of way, because of his steadfast leadership and his remarkable rhetoric. History tells me he was more conservative than my ideology but I’m a firm believer that where one lies on the political spectrum says almost nothing about one’s character. Bravery is bravery. Orwell though is one of my personal heroes, because his writing was so visionary and prophetic, so concise and so dedicated to truth telling and moral consistency (his unfortunate anti-Semitism notwithstanding). In Homage To Catalonia he modeled truly independent seeing and thinking in point-of-view journalism. And I read and cherished his essential essay on Politics and the English Language well before the propaganda cabal of the Republican Party and FOX News began, but it was my decoder ring for recognizing that dangerous abuse of truth and democratic decorum when it got rolling almost 20 years ago. Orwell has been a guiding light for some of my favorite contemporary commentators as well, chiefly Christopher Hitchens and Andrew Sullivan. And all of the above, with their own individual backgrounds and panache kept coming back to the core concern: opposition to authoritarianism and defense of liberal democracy. Authoritarianism, sad to say over the long view, is one of humanity’s default states. It’s more like gravity while liberal democracy is the heavy lift. This explains the frequently deployed building metaphors about our institutions and values — that they’re like a foundation or an edifice or something requiring structure and thought and engineering. Because they do, and maintenance as well. We’ve grown pretty complacent over 70 years of (mostly) peace, prosperity, technology and entertainment, so we are overdue for renewal of our understanding of and commitment to democratic values, especially now that they’re under internal assault. We must name them and re-define them and remind ourselves and our kids that the liberal democratic order is more precious and more precarious than we tend to recognize in our affluent, individualistic haze. By virtue of a bizarre and toxic stew of debased television values, civic illiteracy, digital age corporate propaganda and active foreign interference by a geopolitical adversary, Donald Trump became our 45th president. It was a world historical mistake and one not easily undone or atoned for. In his months in office, he’s demonstrated contempt for or complete incomprehension of the pillars of liberal democracy, including a free press, a fair and accurate electoral process, an independent judiciary, the rule of law, the integrity of high office and even our national security apparatus. He is without a doubt the most dangerous and irrational person to ever sit in the White House, and while he is stymied by a range of factors, not least his own managerial and personal ineptitude, he is actively encouraging Americans to join him in his disdain for longstanding and crucial norms and institutions. He literally celebrates and accommodates dictators around the world while insulting partners and allies in the liberal democratic order. His abuse of the truth and his psychological projection of his own liabilities and sins on others is simply epic in scale. There’s no point in going on and on. 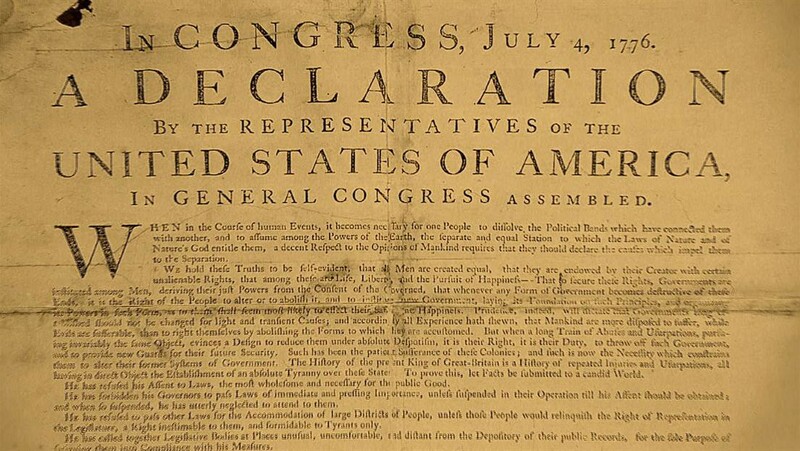 Others have catalogued his abuses better than I can, but let’s just say that whether you’re liberal, centrist or conservative, Trump should be an equal opportunity foe for anyone who believes in human rights and the principles of the Declaration of Independence, which we celebrate and uphold today. Our country on this July 4 is out of character and off course. It is sad indeed that we must salute our founders and our flag with a petty, volatile authoritarian in the White House. But when it comes to rights and what’s right, this country has climbed from as low as it gets, a slave nation, to historic heights. Lord have we stumbled and gone astray. In my mere lifetime, inter-racial marriage was illegal in many states, we secretly firebombed Cambodia, our president ignored a domestic plague because it affected gay people, and a splinter group of the executive branch opened black torture prisons in an open-ended war. Donald Trump is less awful than and had nothing to do with any of those transgressions against our charter. Yet he’s a new kind of threat — a rabble rouser and a liar and a kleptocrat. He’s a disgrace to our White House, our service members, our Constitution and our flag. But he will go, sooner or later, and his name will live in infamy. Now and afterwards, we will continue the climb, which is what it’s about. As Americans, we all are expected to be freedom fighters. We just don’t know exactly when we’re going to be called or what our role is going to be. Well the time is now. I choose words and stories and truth telling. I’m no Orwell, but there’s nothing like the fog of jet lag to cultivate delusions of patriotic grandeur.